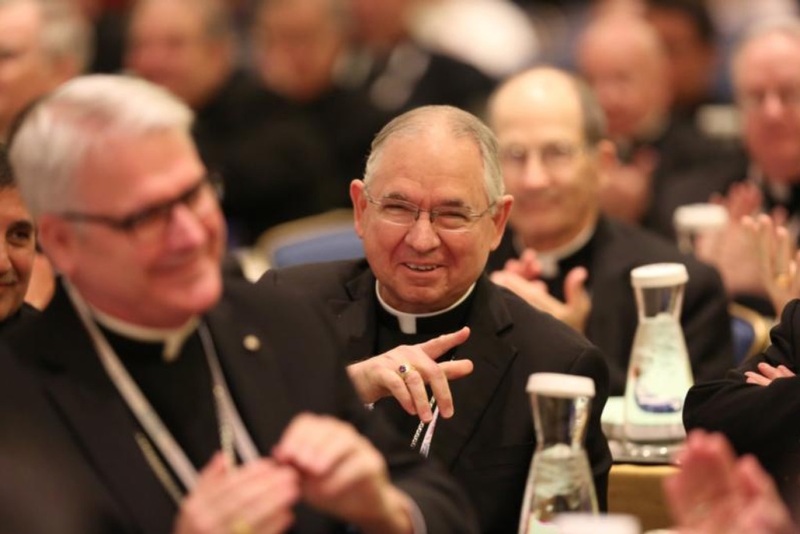 Archbishop Jose H. Gomez of Los Angeles smiles Nov. 15 after he was elected vice president of the U.S. Conference of Catholic Bishops during the annual fall general assembly of the USCCB in Baltimore. BALTIMORE (CNS) — Cardinal Daniel N. DiNardo of Galveston-Houston was elected president of the U.S. bishops’ conference Nov. 15 for a three-year term to begin at the conclusion of the bishops’ annual fall general assembly in Baltimore. Cardinal DiNardo collected a majority of votes on the first ballot of voting during the second day of the bishops’ public session. Based on the number of bishops voting, 104 votes were needed for election, and Cardinal DiNardo — the current vice president of the U.S. Conference of Catholic Bishops — received 113. Elected vice president was Archbishop Jose H. Gomez of Los Angeles. By virtue of his election, Archbishop Gomez will not take over as chairman of the bishops’ Committee on Migration. He was elected last year as chairman-elect of the committee and was to succeed the current outgoing chairman, Auxiliary Bishop Eusebio L. Elizondo of Seattle, at the end of this year’s general assembly. The bishops also voted for chairmen-elect of five standing committees and three representatives for the board of Catholic Relief Services, the U.S. bishops’ overseas relief and development agency.